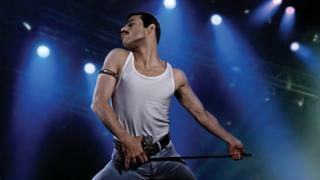 Oscar-winning Freddie Mercury biopic Bohemian Rhapsody was released in China on Friday, but references to the Queen singer's sexuality and AIDS diagnosis were censored. Several minutes of footage were edited out of the film, including scenes of two men kissing and the word "gay". There has been significant reaction to the film's release online. More than 50,000 users have posted reviews on Sina Weibo, China's Twitter-like micro-blogging platform. Though some users complained of "half watching and half guessing" as a result of the deleted scenes, others were pleased the film had been released at all. Explicit and implicit references to Mercury's sexuality were edited out, including an important scene in which he comes out to his then-girlfriend. Other scenes to be removed include a close-up of Mercury's crotch as he performs, interactions with his male partner Jim Hutton and the entire sequence in which the character and his onscreen band-mates recreate Queen's iconic music video for 1984 single I Want to Break Free, in which they dress in women's clothes. "If there were no deleted scenes it would have been better," one Weibo user wrote. "It's really good that Bohemian Rhapsody is being screened in the mainland," said another. "But the plot was broken because of deleted scenes." Homosexuality has been legal in China for more than two decades and the Chinese Society of Psychiatry removed it from the country's classification of mental disorders in 2001. But the movie's censorship was widely anticipated. In February, broadcaster Mango TV's Oscars coverage was heavily criticised after it amended a reference to homosexuality in the acceptance speech of Rami Malek, who plays Freddie Mercury in Bohemian Rhapsody. The same outlet was condemned in 2018 for censoring rainbow flags and tattoos in its broadcast of the Eurovision Song Contest. At the beginning of this year, another streaming service, iQiyi, was mocked for blurring the earlobes of men wearing earrings in what many observers interpreted as a heavy-handed attempt to perpetuate "traditional" gender roles.